So far, that’s all good. But they also contain around 160–200 mg of cholesterol. Because of that one component, they got a bad rap. Egg consumption was discouraged, especially the yolks. Cholesterol-free egg products were marketed. Restaurants offered egg white omelets. I admit I fell for it. I tried to limit my egg consumption. I bought Egg Beaters; I threw out yolks and used only the whites. Now it turns out the bad rap was undeserved. Eggs have been rehabilitated. For decades, scientists have been working their way towards a better understanding of what causes heart attacks and strokes. They got some things wrong but gradually corrected their errors. At first, they noted that patients with heart attacks usually had atherosclerosis, with plaques in the arteries that interfered with blood flow. The plaques contained cholesterol. They reasoned that reducing cholesterol would reduce plaque formation and thereby reduce the risk of heart attacks, so they recommended limiting dietary cholesterol. They relied on a 1913 Russian study that produced atherosclerosis in rabbits by feeding them a high cholesterol diet (but people are not rabbits). And they relied on an epidemiologic study by Ancel Keyes (later found to have faulty methodology) showing that countries where people ate more fat had more heart disease. So they came up with an arbitrary limit of 300 mg of cholesterol a day. Cholesterol is only found in animals, not in plants; plant-derived products that never had cholesterol and couldn’t possibly have cholesterol were labeled “cholesterol-free” to persuade consumers to buy them. Consumers chose margarine with partially hydrogenated vegetable oils over butter, sometimes inadvertently increasing their intake of harmful trans-fats. But only about 15 percent of blood cholesterol comes from what you eat; 85 percent is produced by your liver. When you get less in your diet, your liver compensates by manufacturing more. As more and more studies were done, scientists refined their thinking. It seems the risk wasn’t so much from the cholesterol as from the total fat in the diet. And some fats were better than others. Saturated fats were worse than unsaturated fats, and trans-fats were particularly bad. While elevated blood cholesterol levels are definitely associated with an increased risk of heart attacks, it soon became apparent that reducing cholesterol in the diet was not very effective in reducing blood cholesterol levels. The official government 2010 Dietary Guidelines still recommended limiting cholesterol in the diet to 300 mg a day; but that recommendation was omitted from the 2015 Dietary Guidelines because they felt there was insufficient evidence to establish a quantitative limit. Their scientific advisory panel said “cholesterol is not considered a nutrient of concern for overconsumption.” Wow! A complete turn-around. Current dietary cholesterol intake in the United States averages 270 mg daily. The Institute of Medicine (IOM) still recommends eating as little dietary cholesterol as possible. Dietary guidelines in Europe, Australia, Canada, New Zealand, Korea, and India do not have an upper limit for cholesterol intake. Epidemiologic data have clearly demonstrated that dietary cholesterol is not correlated with increased risk for cardiovascular disease. Some individuals, perhaps a quarter of the population, are more sensitive to dietary cholesterol; but as their total blood cholesterol rises, their good HDL cholesterol rises too, so there is little overall impact on cardiovascular risk. Dietitians and cardiologists still recommend limiting egg consumption, especially for their patients with heart disease or diabetes; but their caution is not supported by the evidence. Some studies showed a higher risk of heart disease with dietary cholesterol, but most of them failed to account for potential confounding by other features of the diet like saturated fat intake (bacon is frequently eaten with eggs, and and bacon is not so good for you). Two large prospective cohort studies of healthy adults found no increased risk of cardiovascular events (heart attacks and strokes) with egg consumption in either men or women. They did find an apparent increased risk for the subgroup of diabetics, but a recent study reviewed the published literature on the relationship between egg consumption and cardiovascular disease in individuals with type 2 diabetes. 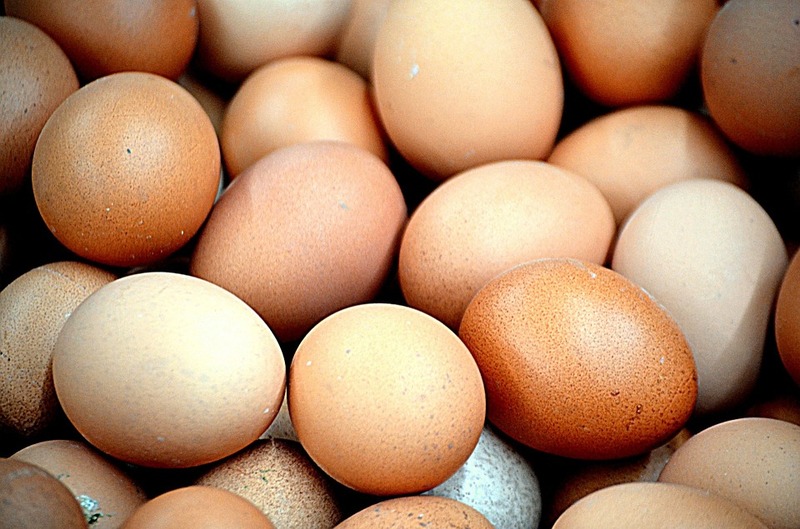 They found that consumption of 6–12 eggs a week had no impact on total blood cholesterol, low-density lipoprotein-cholesterol, triglycerides, insulin or C-reactive protein. In fact, two thirds of studies found that it improved the “good cholesterol” HDL. In one study, men who consumed more eggs had lower serum cholesterol than men who consumed fewer eggs. Replacing carbohydrate-rich foods with eggs benefits the heart by raising “good” HDL cholesterol levels and decreasing blood sugar and insulin responses. Eggs are back on the table. They are a healthy food, and there is no reason to limit them other than perhaps the age-old principle of “moderation in all things:” an eggs-only diet would not be a good idea. But eating eggs regularly as part of a healthy diet is an eggs-cellent plan. Enjoy!